Nonni’s, creator of the number one selling almond thins, have added THINaddictives in Banana Dark Chocolate and Blueberry Oat to grocery stores nationwide. Yum! These are So Good, I Could Have Them for Dessert. My big time barbecue buddies (especially those on BBQ competition teams) know it takes untold hours to smoke up pork, beef, and chicken. The coffee is usually perking to keep everyone kind of half way functioning. 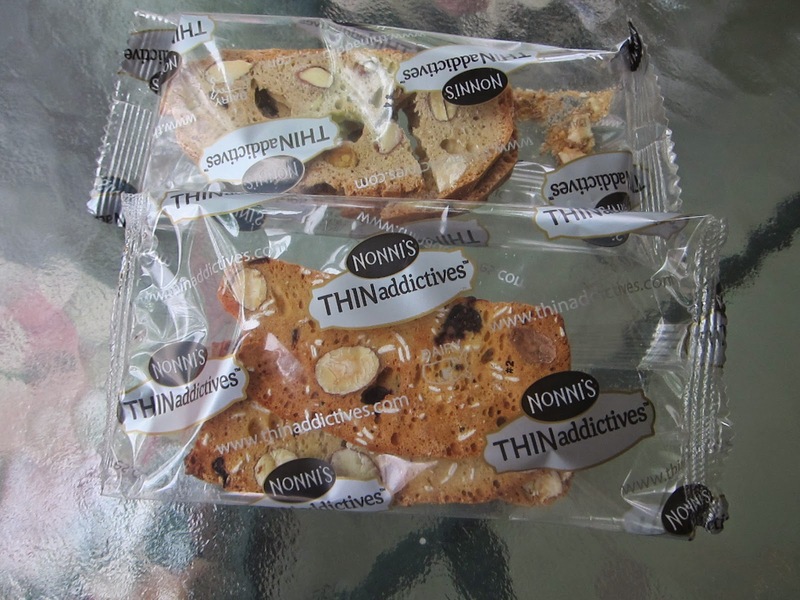 Add these nut and fruit thins, and your taste buds will jolt you back awake. 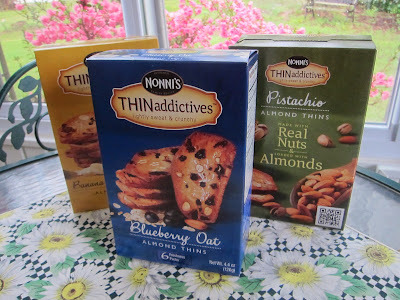 I'd never been a big thins fan (just not on my radar), until I got these. They are so good, I am sitting here thinking about eating my photo packs, so I better get them up quick. OK. Now I Can Eat Them! Nonni's sent them over and told me they were really good and also guilt-free with real ingredients like whole blueberries and bananas. Sugar is low (5 grams or less) and so are the carbs (14 grams or less). They run 100 calories per serving but taste more like a sinful dessert. I got to check out the two new flavors and the pistachio which is one of my all time favorite flavors ever. The nut one is crisper. The fruity one are crisp but a little softer with the fruits (which my son prefers). There are five flavors total, and I loved the three I tried, so I'd imagine everything in this line would be tasty. Google or Bing THINaddictives and follow on Facebook, Twitter, Pinterest, Instagram for healthy living tips and for chances to win. They are running contests now, and I'm sure they will have more in the future. If you don't know where to find these healthy treats, then here is the store locator on the Nonni's site. The two near me are Harris Teeter and Wal-Mart. I'd never seen them but never looked. Now I'm hooked. They really are that good and much better for me than a big, old candy bar. I came across your blog today as I was browsing through different sites related to BBQ. I look forward to seeing your posts in the future and learning some of your unique perspective on 'Que!